I didn't get to eat enough squid from our Valentine's dinner --- my daughters love calamares so much and they ate almost all of it. So I thought of cooking squid again last night. But not calamares anymore. I cooked adobong pusit (squid adobo). Adobo is a Spanish word which means seasoning or marinade. In the Philippines, it refers to the popular dish and cooking process that involves meat or seafood marinated in vinegar, soy sauce, garlic, and other spices then browned in oil, and simmered in the marinade. 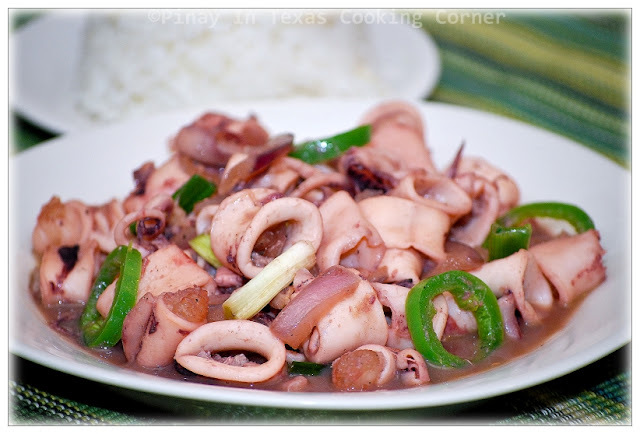 Pusit (Squid) is the most common seafood that can be cooked with adobo method, and adobong pusit is the quickest-to-cook adobo dish. Pusit is done in less done 10 minutes and medium-sized squid can easily absorb flavors so in cooking adobong pusit, there’s no need for marinating. 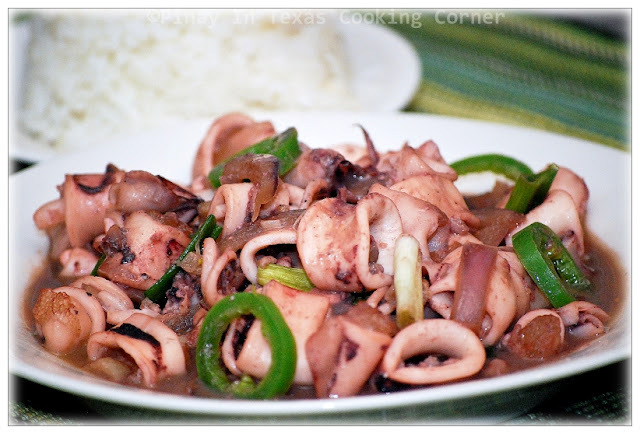 If you are using fresh squid, your squid adobo will have purplish-black sauce due to the inclusion of squid ink. Since fresh squid is not available here in our area, I used frozen squid so the sauce is just brownish like other adobo dishes. You can use any kind of squid for this recipe, but small to medium sized squids are better because they are more flavorful compared to large ones. Just be sure not to overcook the squid to preserve the tender texture. 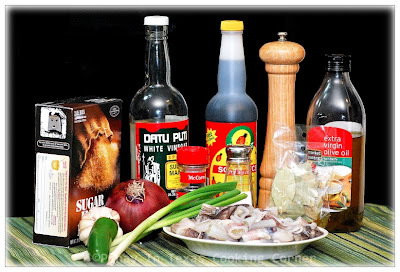 Adobong Pusit is the most popular way of preparing squid among Filipinos. It’s really good! Try it! 1.Clean the squid. When I’m cooking adobong pusit, I don’t remove the squid's skin. Neither do I remove the innards. I just remove the beak (which is a bony piece of inedible cartilage that it is located at the base of the tentacles) and the thin transparent cartilage from the body of the squid. Carefully remove the ink sac and set aside. 2.Wash and drain bodies and tentacles. Some cook the squid whole. I like cutting them into bite size. Sprinkle with salt and pepper. 3. In a saucepan, sauté garlic in 2 Tbsp oil over medium heat until light brown. Add onion and sauté until translucent. Add squid. Stir fry for a minute. 4. Add the ink, fish sauce, vinegar, soy sauce, bay leaf and peppercorns. Mix well and cook over medium low heat for 5 mins. 5. Add sugar and salt to suit your taste. Add Jalapeño and green onions. Cook for another 3 minutes. Remove from heat. Serve with hot rice.